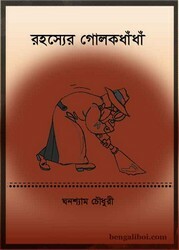 'Rahasyer Golakdhandha' is a detective story collection book which is written by the distinguished Bangali child literary Ghanshyam Chowdhury. The bokk has three detective stories for the teenager, these goenda stories are- Ganga Ridir Bish, Chhobol, Madhyarater Chhaya. All adolescent readers can collect this story book as pdf file. The pdf has three stories 146 pages, 10mb pdf file size.